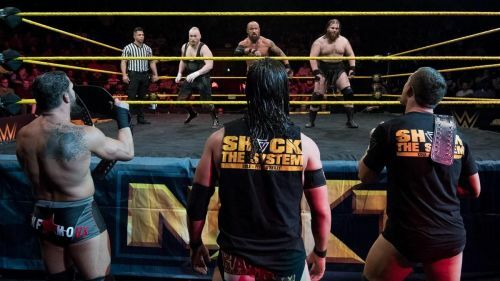 SAnitY was an incredibly dominant force while in NXT. However, after a struggling year on the main roster, and Eric Young being drafted to Raw, the trio has fallen apart, leading to a shocking announcement. While they managed to take out the seemingly unbeatable Authors of Pain in 2017, capturing the NXT Tag Team Titles at NXT TakeOver: Brooklyn II. Though they only held the titles for a few months, dropping them to the Undisputed Era's Bobby Fish & Kyle O'Reilly on December 20th of that year, SAnitY established themselves as a force to be reckoned with. Sadly, that didn't translate to Tuesday nights. The trio was drafted to SmackDown Live after WrestleMania 34, but their debut was delayed by a few months. Though they defeated the New Day in a Tables match at Extreme Rules, they never won a tag team match on Tuesday. Their run was driven further into the ground when they lost a three-on-one handicap match to The Miz prior to WrestleMania. Last night on Monday Night Raw, it was revealed that Eric Young had been drafted to the flagship show, quietly putting an end to SAnitY. Afterward, Killian Dain posted a heartfelt message to his partners, Young and Alexander WOlfe, for a fun ride in the company. Today, Alexander Wolfe said his goodbyes, not only to Killian Dain and Eric Young, but to the entire WWE Universe. Wolfe went over the group's accomplishments before wishing the entire SmackDown locker room the best before stating that it was time to "walk a different path." Wolfe ended the statement in a heartbreaking manner with "RIP SAnitY. Goodbye #WWE." SAnitY was a group with tons of upside in the WWE. When they were drafted to SmackDown Live, many assumed they would become the new, and possibly, improved Wyatt Family. With Young on Raw and Dain on SmackDown, hopefully they'll find success as singles competitors. Whatever Alexander Wolfe does going forward, though, the fans he and the rest of the group amassed over the past few years will be eagerly awaiting to support him.